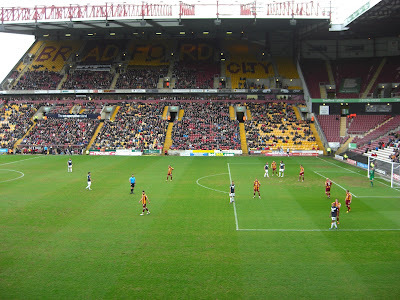 My ninth stadium of 2012 was on Friday 6th April 2012 at Valley Parade in Bradford, West Yorkshire. The match was Bradford City vs. Southend United in Football League Two. 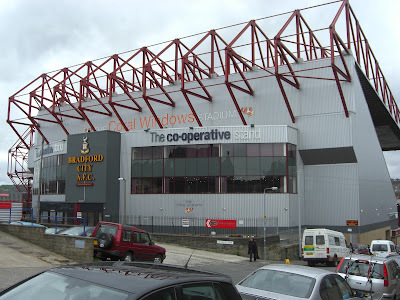 Valley Parade, also known as the Coral Windows Stadium, is located in the city centre of Bradford. There are two railway stations within a mile or so of the ground, Bradford Forster Square and Bradford Interchange, which means that transport links to the venue are good. 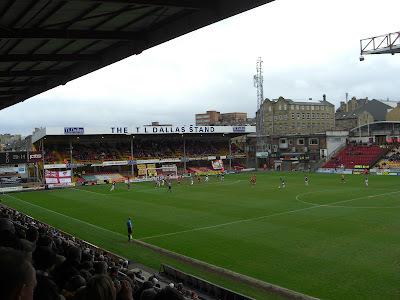 The ground has been home to the club since 1903 although they were absent from the venue between May 1985 and December 1986 after rebuilding was required in the wake of a disastrous fire which claimed the lives of 56 fans. Valley Parade itself pre-dates the football club by 17 years as it was originally built in 1886 to house rugby league team Manningham RFC. The stadium has a very lopsided look to it with two large stands dominating the rest of the ground. Much of the total 25,136 capacity is taken up by these two stands. The Main Stand is a two-tiered stand which runs most of the length of the pitch on the west side of the venue. It can contain 9,004 fans including a single-tiered section which sits next to the main structure and is not covered by its roof. The other large stand is The Kop, a 7,492 capacity two-tier stand which sits behind the goal at the northern end of the venue. Linking the two stands is a quadrant in the north-west corner which can hold an additional 2,300 fans. Running alongside the pitch on the east side of the ground is the Midlands Road Stand, a single-tier stand which can seat 4,500 people. Away fans are allocated the southern end of this stand. 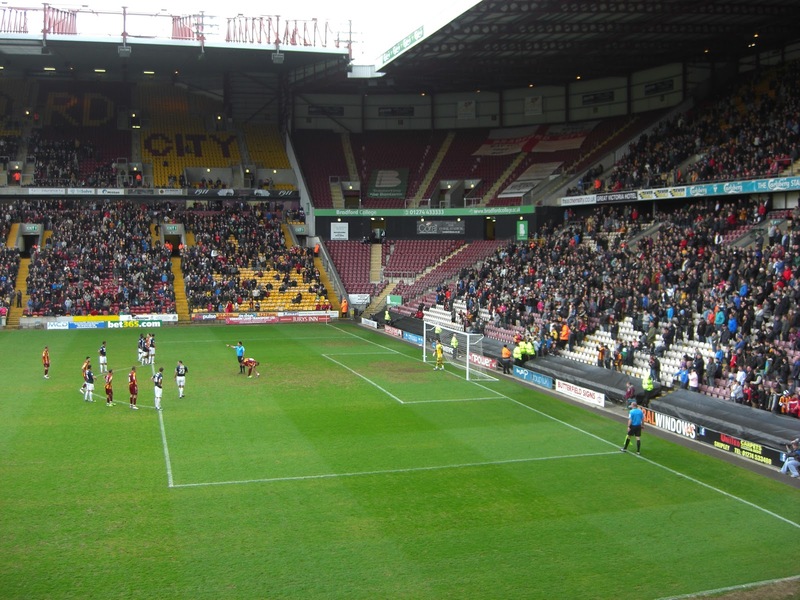 The remaining stand, the Bradford End, is located behind the goal at the southern end of the goal. With a capacity of just 1,800 this double-decker stand is the smallest in the ground. It is the only structure in the venue to feature stanchions which can restrict views. Because of the confined nature of this end of the stadium the stand does not extend all the way along the southern side of the ground with a scoreboard placed in the south-east corner. The game featured a fairly tedious opening half an hour with lots of long-ball football and little in the way of chances. However, towards the end of the half things started to open up a bit and the opening goal came in the 38th minute when James Hanson headed in Michael Flynn's cross from close range to give the home side the lead at the break. It got worse for the visitors after the interval as Southend defender Sean Clohessy brought down Bradford's Nahki Wells in the box with a penalty awarded to the home side and a red card to Clohessy. Cameron Belford in the Southend goal got a hand to Craig Fagan's penalty but could only push the ball into the top corner as Bradford doubled their lead. In the 67th minute Southend were reduced to nine men when substitute Elliot Benyon kicked out at a Bradford player and received his marching orders. From this point on Bradford comfortably controlled the game but despite creating a few chances were unable to improve their winning margin.